Good morning and welcome to all of you. Thank you for being here for such an important occasion. As Acting Superintendent, it is my honor to represent Gettysburg National Military Park and Eisenhower National Historic Site today. I want to extend a special welcome to our candidates for citizenship here today and to our award-winning participants in the Great Task Leadership program. As a veteran, I will share with you that I am always humbled when I visit this cemetery and look out over these honored dead. With American democracy hanging in the balance, the largest Civil War battle, waged here, can never be forgotten. Earlier this month, the nation commemorated the Centennial of the end of the First World War. Just across the fields to my right, the U.S. Army set up a tank training camp (called Camp Colt) to help our forces prevail in that war. At Camp Colt, a young Captain Dwight David Eisenhower tested himself and his men. Eisenhower learned some of the leadership lessons here that would help him lead our military to victory in the Second World War just 27 years later. Here in the most sacred space within Gettysburg National Military Park we are surrounded by the final resting places of veterans of those wars. Many, killed in action. In Soldier’s National Cemetery and throughout the more than 6,000 acres of the battlefield, our mission is to preserve and protect the resources of the park and provide a visiting experience that is memorable and inspirational. The mission of the National Park Service centers on saving our nation’s treasures and our nation’s stories. Here, we offer the lessons of sacrifice, and lessons of leadership, and a hard-bound commitment to rededicating ourselves to the ideals established by the founders of this nation. But we cannot do it alone. We need each of you here today and all our citizens to help us care for these parks. I’m pretty sure that every one of you here today understands that. We know your commitment and we thank you. To the young people here in the audience today, I especially want to say we thank you for being here. Your presence speaks volumes. This is your park. It belongs to all Americans. And it is a special gift to our new citizens today. The legacy of Gettysburg and the responsibility to care for these special places belongs to all of us. I would like to recognize students here from Edgar Fah Smith STEAM Academy of York, Pennsylvania. These students, recipients of the 2nd annual Great Task Leadership Award, embody Abraham Lincoln’s vision of an active and engaged citizenry. They recently participated in our “The Great Task” Youth Leadership program. Each of these students groups were asked to set Lincoln’s words here at Gettysburg into action within their school and their community. The Smith STEAM Academy received the “Great Task” Leadership Award for developing plans to help victims of gun violence, creating after school programming and peer counseling in their community and providing support to local animal shelters in need. Please join me in congratulating these remarkable students. 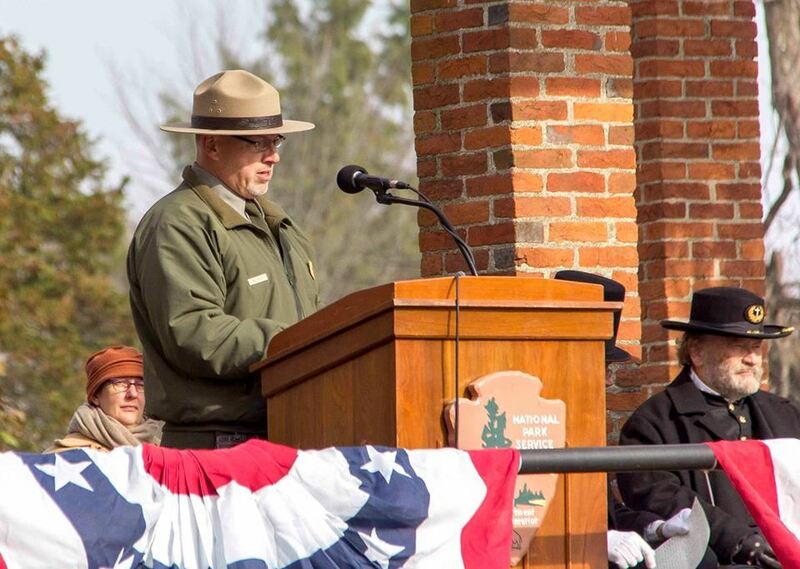 There are many stories that these two national parks have to offer and I encourage each of you to take a little time and attend some of the programs offered by our staff here at the Gettysburg and Eisenhower parks, to learn more about your National Parks!